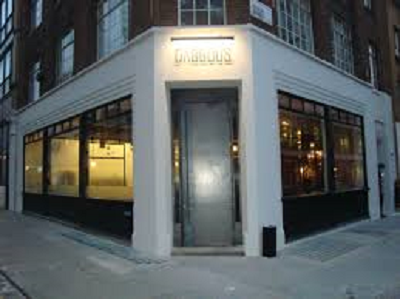 The Dabbous restaurant is part owned by Oliver Dabbous widely acknowledged as one of the rising young chefs on the London scene. Trained in kitchens of Raymond Blanc’s Le Manoir aux Quat’Saisons , Dabbous opened his restaurant in 2012 and quickly gained Celebrity status in the Foodie world and a Michelin Star. In a very limited menu often only five starters and six mains, a sample of the menu include Cod, chestnuts & bitter leaves, Chicken with fenugreek, lettuce & clover, Avocado, basil & almonds in a chilled osmanthus broth and Burrata with wild strawberries & fennel pollen. Downstairs at Dabbous is a basement bar, presided over by Dabbous ‘s business partner Oskar Kinberg who mixes the classic cocktails, but also include some of his own creations, such as his “Sloe Gin Punch”, a refreshing blend of homemade sloe gin, hawthorn syrup, ginger ale and pink grapefruit.